THE PICKIEST EATER IN THE WORLD: THE AWESOME LOCK AND LOCK FEATHER LIGHT TUMBLER! The Lock & Lock Feather Light Tumbler can hold around 500ml of liquid in it. At first glance, it admittedly looks heavy, because of its steel exterior. However, looks can be rather deceiving, because you'll be pleasantly surprised with how light it is, making it a very handy travel companion! To put things into persepective, an iPhone 6 Plus weights around 190 grams. The Lock & Lock Feather Light Tumbler weighs only an astonishing 180 grams! The sleek design and light weight also allows for it to fit snugly into my travel bag, making it an essential for whenever I travel.. Whether out of town or even just around the metro! 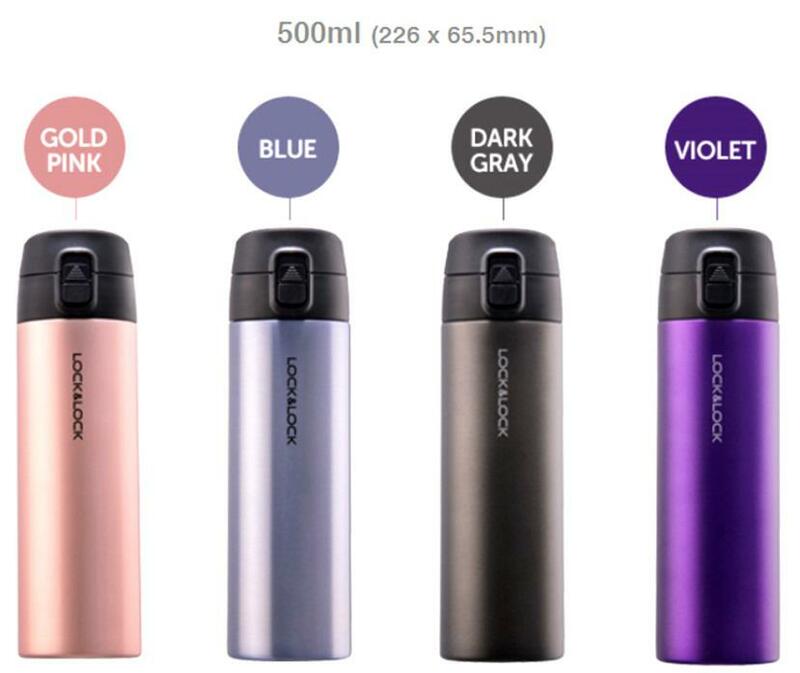 The bottle opens with one touch, but because of easy to use Safety Lock feature, and I can rest at ease in knowing that the contents of my bag, including several gadgets, will stay dry! What makes The Lock and Lock Feather Light Tumbler even more amazing is how it manages to keep it's contents cold or hot. I placed Ice into the tumbler before I went to bed, and I woke up with ice cubes still intact! Rina works nights at home, so when she knows she's in for a grueling schedule, she asks if she could use my tumbler for her coffee, which was kept hot for hours! The Feather Light Tumbler comes in a variety of colors, including Gold Pink, Blue, Dark Gray and Violet. In case you're wondering why I chose the Violet, it's because I was sharing with Rina, and Violet is her favorite color. She managed to convince me to get Violet over the Dark Gray by pointing out that the Violet was the same shade of the Laker's colors. Lock&Lock is available in Department stores nationwide! 3. Megastate Bldg. in Araneta Ave.
Do you want a Feather Light Tumbler? Join my giveaway for a chance to win one! 1) It IS Lock and Lock. It is one of my trusted brands. 2) Violet is also my favorite color :) I'm glad it's one of the choices. 3) I am so happy they are so innovative and come out with new products each time. 4) I saw your photo of the ice cubes which survived overnight and I was super impressed! I don't know any other product that can do this. 5) I usually bring a tumbler or a bottle with water everywhere with me or in the car and my common issues are that they don't retain the temperature of the drink (whether cold or hot) for a long time, they are not very leak-proof when I place them in the bag, and they are also quite bulky. So this lightweight tumbler will really be such a big help! 1) it's a brand you can always rely on, no questions asked. 2) I juggle between the office, school and gym 5 days a week (okay, 3 days maximum lang yung gym part and 2 days lang yung school hehe) but my top of mind is always constant hydration and caffeine replenishment. There are days that I can't bring my container because it's heavy and I fear it would open up and spill on my things, so I resort to bottled water which is not a good alternative to the environment. I want a Lock and Lock Feather Light Tumbler for my everyday water need. It will be very convenient to own this one. I want a Lock and Lock Feather Light Tumbler to give it to my humble husband. he never buy things for his self rather give everything for me and my baby. He is a motorcycle rider, a passionate one hehe Everyday he rides his motor and goes to the Highways of Manila. Its so exhausting. i just want him to have the Lock and Lock Feather Light Tumbler so he can bring it anytime with him. I want a Lock and Lock Feather Light Tumbler because I always bring my own water when I go out and this one's much better-looking than the old Lock and Lock water bottle I use. Aside from its quality and functionality, the colors and its form are quite attractive.